The cost of the public private partnership deal to overhaul London's Tube is soaring, the BBC has learnt. Metronet, the company investing £17bn in improving the network over the next 30 years, estimates it will have a £1bn overspend after seven-and-a-half years. 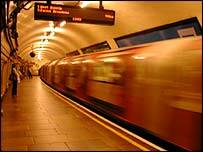 London Underground (LU) says it is the result of Metronet's inefficiencies and that it should foot the bill. But the firm says some of the blame lies with LU for forcing it to do work it was not originally contracted to do. The deal is the biggest example of using private money for public projects - a system supported by Gordon Brown. In February, Mr Livingstone called for an independent review into Metronet's economic performance. It followed a report by the Public Private Partnership Arbiter which found the company, which is responsible for the maintenance and renewal of two thirds of the underground network, will overrun by £750m. The BBC has now learnt the overspend is expected to reach £1bn. BBC business editor Robert Peston said this equated to "taxpayers cash disappearing down a black hole." Tim O'Toole, managing director of the London Underground, told the BBC that the blame for the overspend should be directed at Metronet. He said: "We know the big areas in the stations - they were just uniformly late. They are far, far behind on that work. "There just seems to be some inherent problem in their organisation." Mr Livingstone was a vocal opponent of the PPP scheme, which delegated responsibility for maintenance of the Tube to two private consortiums - Tube Lines and Metronet. And he said Metronet would not get away with "taking the money and not doing the work". He added: "My best advice to them is they should go into liquidation, we can take it back and they can go off into a quiet room and take a suicide pill as far as I am concerned." But Metronet chairman Graham Pimlot said it should be paid for the work it had been asked to do which was not covered in its original contract. "There is no doubt at all that we are going to have to pick up the bill for some of the things that we have not done efficiently," he said. "That's perfectly fair, so long as we are paid for the things that we are doing efficiently, I'll be happy." The chancellor is a strong supporter of PPP, seeing it as the quickest way of building new schools, hospitals and transport schemes. Under the PPP model, public facilities are provided by the private sector which then operates them in return for regular payments by the public body involved, reflecting the cost of providing and running it. The government has said that due to the PPP Tube contracts, almost 250 stations will be refurbished, more than 300 new trains brought into service and 80% of the track updated.